LANDOVER, Md. (AP) – Ben Roethlisberger recovered his own fumble at a pivotal moment and didn’t look back, throwing three touchdown passes to lead the Pittsburgh Steelers to a 38-16 victory over the Washington Redskins on Monday night. Roethlisberger completed 27 of 37 passes for 300 yards, including two touchdowns to All-Pro wide receiver Antonio Brown and another to Eli Rogers. Often playing on the opposite side from Josh Norman and tormenting cornerback Bashaud Breeland, Brown made eight catches for 126 yards. 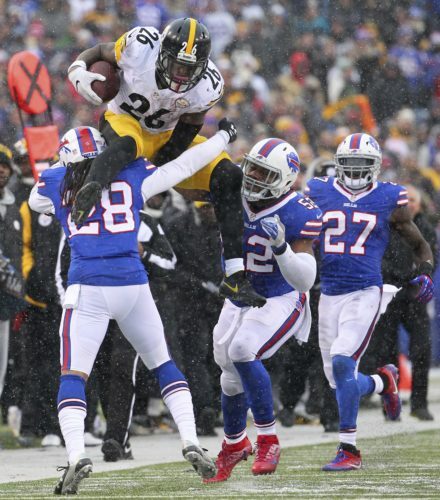 Starting in place of the suspended Le’Veon Bell, DeAngelo Williams ran for 143 yards and two touchdowns on 26 carries. Washington led 6-0 and appeared to have another scoring opportunity late in the first quarter when linebacker Ryan Kerrigan sacked and stripped Roethlisberger deep in Pittsburgh territory. Steelers center Maurkice Pouncey knocked the ball out of Kerrigan’s hands, and Roethlisberger dived on it at his own 13-yard line. Pittsburgh’s passing attack got clicking, but Kirk Cousins and the Redskins couldn’t keep up. With Matt Jones and the running game grounded and tight end Jordan Reed taken out of the picture, Cousins finished 30 of 43 for 329 yards and two interceptions. Washington got it as close as 24-16 on Chris Thompson’s fourth-quarter touchdown. Then Roethlisberger was at it again, taking the Steelers 77 yards as Williams put the game away with a 15-yard touchdown run to break the 30-point mark. PRIME TIME READY: Steelers coach Mike Tomlin improved to 11-2 on Monday night, including 6-2 on the road and 2-0 at Washington. Pittsburgh is 4-1 when opening the season on Monday night, and the Steelers’ 44-24 record on MNF is third-best in the NFL behind Seattle (23-6) and San Francisco (47-25). HOPPING HOPKINS: Washington kicker Dustin Hopkins made all three of his field-goal attempts, connecting from 31, 40 and 34 yards. Hopkins was the Redskins’ entire offensive production until Thompson’s touchdown. PINBALL ROGERS: Rogers’ first career touchdown catch in his NFL debut was a pinball special. Roethlisberger’s pass from the 3-yard line hit receiver Sammie Coates and then Rogers’ facemask before he finished the grab. SHAZIER, PLAYMAKER: The play after forcing a fumble that the Redskins recovered, Steelers linebacker Ryan Shazier picked off Cousins to set up Brown’s 26-yard TD catch in the third quarter. Shazier left the game with a right knee injury. REED OPTION: Reed caught three passes for 39 yards on the Redskins’ opening drive and was a nonfactor with four catches for 25 yards the rest of the way.